If you make any kind of product, I highly recommend Jeff Walker's book [bl id=”1443″]Launch: An Internet Millionaire's Secret Formula To Sell Almost Anything Online, Build A Business You Love, And Live The Life Of Your Dreams[/bl]. This guides you through his perfected Product Launch Formula® to launch products well. I'm in the information business. I create training products, one-on-one consulting, group courses, and software services for podcasters. Ray Edwards highly recommended [bl id=”1443″]Launch[/bl], and I knew that I wanted to launch products better. So I purchased the book and read it in a couple weeks. Jeff Walker's story is amazing—almost too amazing to believe. But like everyone else, Jeff started with little or no influence. His Product Launch Formula has helped others launch more than $500 million in sales, and he has made millions off his own product launches following the formula he figured out. This is not magic, luck, or “get rich quick” fluff. I'm very alert to that kind of stuff and I strongly avoid it. (Sometimes, I think I resist it so much that I also resist legitimate, proven marketing strategies, to my own hurt.) [bl id=”1443″]Launch[/bl] contains stories of people who got their start with a meager $1,600 product launch all the way up to more than a million dollars in a launch. The first thing you have to know is that influence is the most important factor. Influence is divided into two sides: how many people you reach and how well you can inspire them to take action. Yes, product launch successes rely heavily on numbers. But before you have a massive following, you have to start your momentum somewhere. We all started with zero! Jeff Walker's Product Launch Formula, as presented in his [bl id=”1443″]Launch book[/bl], is simple and effective. Build an email list. Offer an incentive like a free report, ebook, video, or autoresponder series. I recommend Aweber or MailChimp for email lists. Provide valuable content before your launch. In a series of emails, address both a problem and its solution. Each “prelaunch content” is an opportunity to build trust, authority, anticipation, reciprocity, and other “social triggers” (I'll mention in a moment). Launch with urgency and bonuses. After building up enthusiasm for your product, launch it with extras that early buyers can appreciate, and make the launch offer expire at some point. That's my quick summary of Jeff's Product Launch Formula. It makes total sense and I think presents more value and builds better relationships that simply launching and announcing a product's availability. This all works because of “social triggers.” These are psychological things that inspire us to take action on something. Jeff covers several in Launch, and several more in his Product Launch Formula course . Here are just a few to give you the idea. Trust—By creating valuable content that isn't focused on selling something, your audience will begin to trust you. Authority—When you consistently create content that is accurate and helpful, you become respected as an authority and influencer on the subject. Reciprocity—Following the Product Launch Formula, you're giving away great information for free. If that content helps or entertains your audience, they'll feel more like reciprocating when they have an opportunity. Jeff discusses many more, and the relationships between each of them, in his book [bl id=”1443″]Launch[/bl]. I know a big object you may raise, and I did, too, “He has this success because he has a big email list already.” It's certainly true that the larger your following, the more leverage you have for bigger action and thus more profitable launches. But Jeff Walker's Launch book and Product Launch Formula course also explain the idea of a “Seed Launch”—launching something with no list and not even a product! Build an email list, even if it's tiny. I recommend Aweber or MailChimp. Ask your list what they want to know about the subject your product will address. Answer their questions in a series of messages. Expand on the answers to develop the product. It's brilliant! You're taking your current knowledge, discovering the needs and wants of your audience, finding ways to meet those needs and wants, and then providing the solution in a relevant product you can launch to an audience that already needs and wants it. Each chapter of [bl id=”1443″]Launch[/bl] starts with a story of someone's launch. These stories are inspiring and relatable. There are stories of people with barely any money but a great idea, people launching new businesses, and already-successful people expanding their reach with something new. I have plenty of highlights of actionable items, powerful paradigm shifts, and effective reminders throughout my copy of [bl id=”1443″]Launch[/bl]. I plan to use this formula for my upcoming podcasting products and services. Jeff Walker's Product Launch Formula isn't just about dollars, either. It's about building momentum that will lead you from success to success. Yes, you'll have failures, as Jeff has, too. But failures are easier to overcome when you already have momentum—even from small successes. I think that Product Launch Formula can work even outside the world of launching products. You could easily use the same strategies to launch a podcast, a conference, a community group, a fundraiser, a new blog or website, and more. 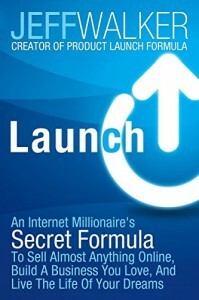 I highly recommend Jeff Walker's [bl id=”1443″]Launch book[/bl] and, by extension, his Product Launch Formula course. Did you read [bl id=”1443″]Launch[/bl]? What did you think and how are you planning to implement the strategies?